This week’s post was originally planned to be Thomson’s Caledonia Road Church, however I’ve fallen down a bit of a well of Thomson appreciation and want to get through some more reading before I begin writing that one up. My research this week has been primarily confined to one book, Andor Gomme and David Walker’s ‘Architecture of Glasgow’, thankfully found in the office library given its inhibitive £50 average second-hand price tag. I’m only part way through it at the moment but it’s proving to be essential reading, I’ll cover this in more detail in a planned future book review post. 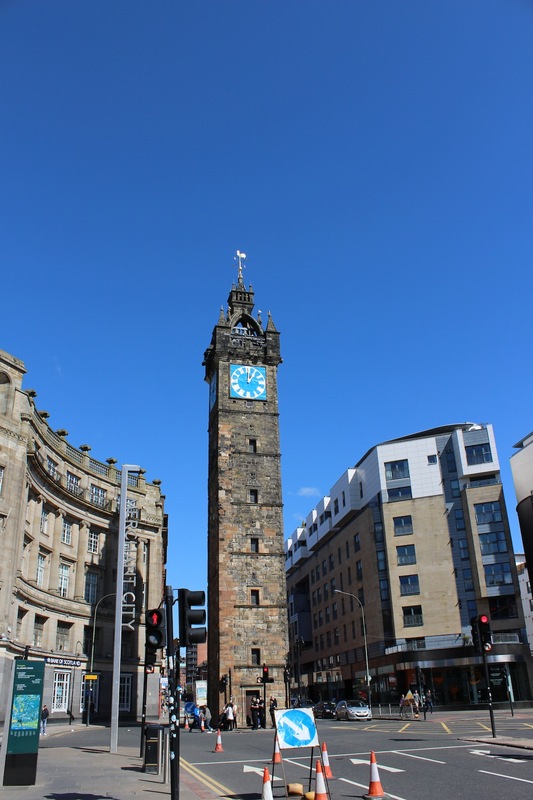 So instead this week I’m going to cover the Tolbooth Steeple at Glasgow Cross. I was inspired to look further into this building having spotted it in a book of old photos of Glasgow and realised that the steeple used to be attached to a 5-storey townhouse, demolished in 1921. Archive photographs available on the Virtual Mitchell are similar to the view that I first saw, this one in particular shows how the steeple used to define the corner from Trongate onto High Street. Following the reformation in the sixteenth century and the subsequent abandonment of the episcopacy in the seventeenth the northern section of the city fell into decay and the heart of the city became the intersection of her four main streets, High St, Gallowgate, Trongate and Saltmarket (John McCarthur’s 1778 survey gives an accurate idea of the urban pattern at the time). 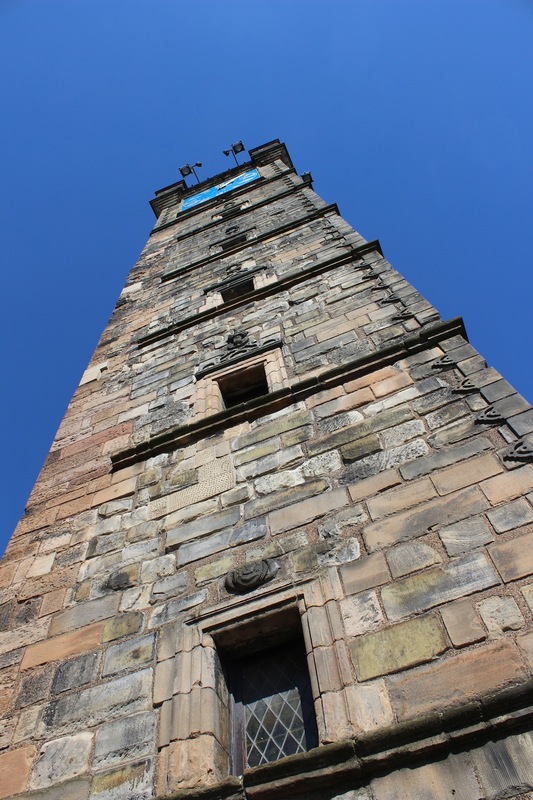 Completed in 1634 by John Boyd, who served as both architect and master mason, the Tolbooth contained the town clerk’s offices, the council hall and the prison in the main block. The steeple itself was utilised as the backdrop for the public dispensation of justice with criminals hung on a scaffold erected on the south elevation of the steeple so that they would be facing Gallowgate, whilst spikes were usefully supplied for the heads of traitors on the northern elevation, presumably to keep them out of the, always plentiful, Glaswegian sun. Whilst there was surely plenty of legitimate criminals imprisoned in the Tolbooth there was also plenty incarcerated for their religious beliefs, whilst records also show numerous payments to Alexander Cunningham, assistant to the Tolbooth keeper, for expenses relating to the imprisonment of witches and warlocks. However, other more palatable civic functions also took place there including the reading of proclamations from the front of the steeple, an important function at a time when levels of literacy were considerably lower, posting of the electoral rolls on the steeple walls, and the provision of reading rooms within the town house which gave access to newspapers. Architecturally, the now-demolished town house was a six-bay wide, five storey with a crenellated parapet, paired turrets defined the eastern and western edges of the Trongate facade whilst a trio of chimneys rise from behind pointed battlements at the centre of the elevation. 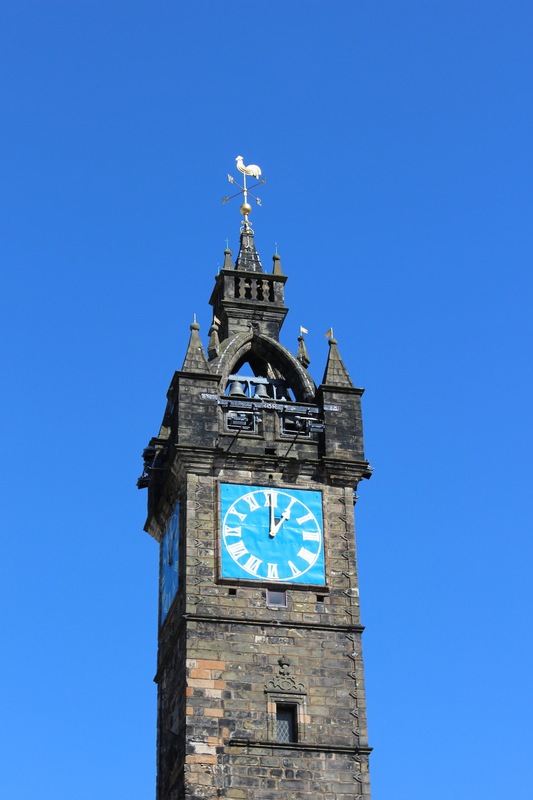 The steeple rises seven stories with little articulation aside from string courses, small windows with a strapwork pediment above, buckle quoins at the corners not previously attached to the town house and a blue and gold clockface to each elevation at the seventh storey. Above that the building bursts to life, where pyramid-topped square turrets (word of the day: I now know these are called ‘bartizans’) supported on an oversailing parapet emerge at the corners, whilst behind an open crown steeple springs heavenwards from four flying buttresses, the composition culminates with a gilded weathervane sited atop the uppermost pyramid. To break from architectural description, and it could be strongly argued, sanity for a moment, I can’t but look at this building and think that it looks a bit like a giant spear of asparagus! I’ll let you make up your own mind on that one, however I didn’t think “rising asparagus-like” was a phrase I could legitimately include in a post without any kind of preface! 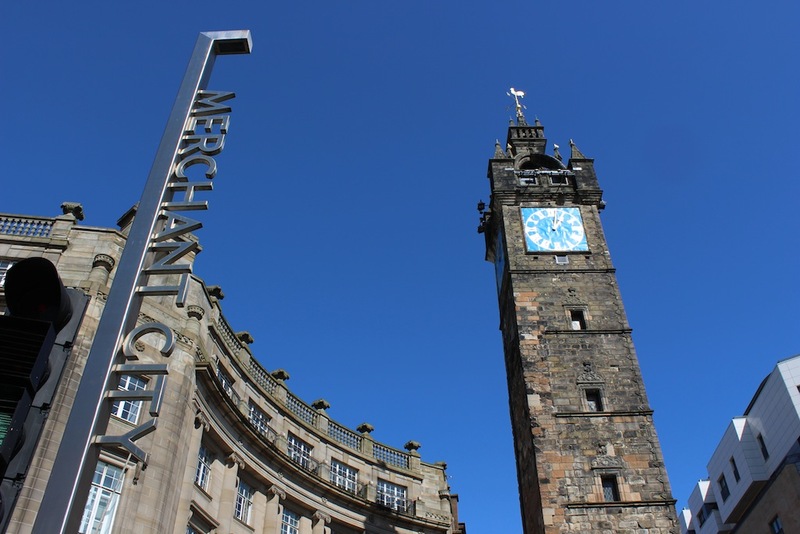 The base course of the Tolbooth was previously a pend, similar to the nearby Tron steeple, however with the encircling of the building with road, the building was no longer required to serve such a purpose. It seems likely that the pend was closed off around a similar time to the demolition of the existing building in 1921 and the construction of Graham Henderson’s quadrant in 1922. Incidentally, the quadrant building was originally intended to be one half of a double quadrant either side of High Street to make a feature of the tower, but sadly the second half of the project was never completed. Alan Cook’s blog post on the steeple also includes drawings of various other proposals for the site including a convex quadrant as opposed to the constructed concave one, and re-building the steeple a few metres away on the site that is now home to the Mercat Cross. 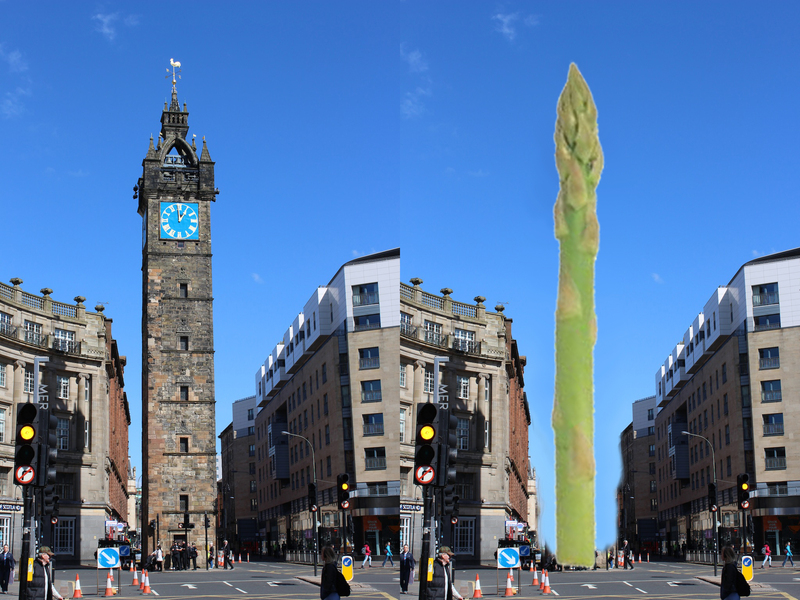 The steeple has been threatened with demolition in the past due to it’s enisled position in the middle of one of the busiest junctions in the city, but following a 2011 refurbishment the future of this Glaswegian icon seems secure, as well it should be. At the time of it’s construction Glasgow’s population was approximately 10,000 and it has stood sentinel over the city as its population has grown to almost 600,000. As an elder statesman of the city that is both visually interesting and culturally crucial it is a building that certainly deserves your attention. nice shots! did you photoshop the blue sky LOL. i totally agree it would have been a crime to tear it down. Luckily I walk past it every day, blue sky just required a bit of patience! I have a post on this coming up soon, also with blue sky! Perhaps we were there on the same day. Mine doesn’t have asparagus though, how could I have overlooked that? I think the asparagus is only available to those who have taken leave of all sense! Oh, that’s ok then, I thought I’d really missed a trick. What about getting inside? and when do the bells toll? At elections or only at executions? Getting inside seems to be reserved for Doors Open Day tours, hopefully be able to get in at some point for a nosey. Not at elections any more, and given the lack of executions these days it is hard to tell! A Hemingway novel set in modern day Glasgow would be considerably lighter on the campanology references! Seems rare that they are rang for any purpose other than their hourly duty.